Made in the USA, by Professional Craftsmen, with World Class Workmanship, and the Latest Styling. Each masterfully stitched and meticulously pattern matched by our experienced craftsmen. Our bedding features a common thread. It's called Craftsmanship. As a Designer, it's important for you to work with people you can trust implicitly. Professionals who listen to your ideas, then transform your fabrics into exquisitely finished pieces. At The Quilting House, we offer the very best in Custom C.O.M. Bedding. So many choices, it's easy to let your imagination run wild. 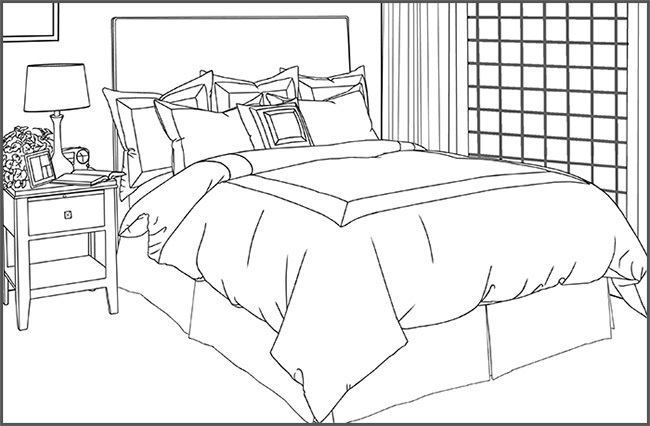 Bedspreads by definition are made to cover the whole bed, head to foot and side to side, all the way to the floor. Typically, bedspreads are quilted. We have a large variety of possible quilting patterns to fit your design style. The fill weight can be chosen from a range between 4 oz to 16 oz. to suit your needs The most popular fill weight is 10 oz. Another popular fill option is to use 6 oz, for those that want a slightly lighter, less bulky bedspread. During the quilting process the lining is quilted with the top fabric, locking it in place and preventing any shifting. Final cutting is done to your specifications, and is inspected at many points in the manufacturing process. Your sleeping pillows can be managed using several different methods. Bedspreads can be made with a standard pillow tuck (20”), or have no extra length for bed pillows (no pillow tuck). Another possible option to cover your pillows is to order a reverse sham (35”). A reverse sham can have any of the bottom edge options applied. We have many different corner options for our bedspreads. They can be made with a throw style or have fitted corners. Throw style gives the standard bell shaped corner. 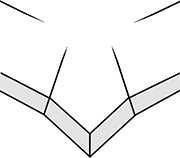 Fitted style corners can be made with or without a tongue, and if needed the tongues can be split partially to accommodate almost every situation. 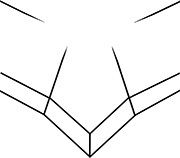 Fitted style corners can also be capped (closed) on 2 or 4 corners, or partially capped with splits. Splits may also be done on throw style at the foot, (at the width of the bed), up the corner diagonally, or on the sides of the bed at the foot end of side drop. Fitted style bedspreads can be made with or without top welting. The bottom edge can have a variety of finishes. The simplest finish is to have our standard hemmed edge. Another popular option is to add a top or bottom welt (sizes range from ¼”, ½”, or 1”). Other options include Scalloped, welt, rope, fringe, gimp, ruffle or flange. Banding can be used to add a special touch to the body of any bedspread or reverse sham. Banding can be applied at the top or the bottom edge of the bedspread. When ordering please specify location and size of banding. If you want a completely reversible bedspread, it must be a throw style, or capped corners. We can quilt 2 separate pieces in different quilting patterns and join them at the edge, usually 6oz to 8oz for each piece. This will increase the labor charges. Please request a quote.